Tarantula Hawks (Pepsis spp.) 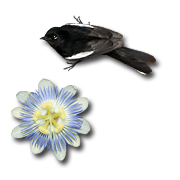 are large wasps that are up to 2 inches (5 cm) long with black bodies covered in a blue-green sheen and red, orange, or blueish-black wings. Tarantula hawks with red or orange wings are the most common here in Tucson, but I have seen a couple of blue-winged tarantula hawks as well. 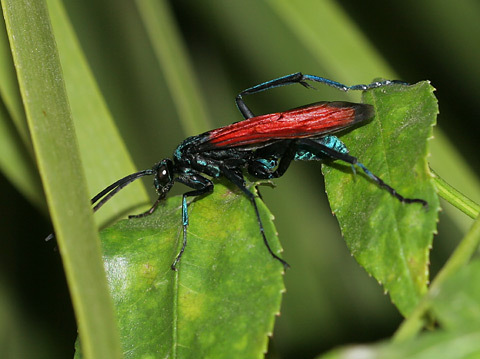 Their bright colors are a form of aposematic coloration and are meant as a warning to potential predators that these wasps are not safe to eat. Tarantula hawks are not poisonous or foul-tasting, instead the females have one of the most painful stings of any American insect, at least according to the Schmidt Sting Pain Index. Most predators avoid these large, rather slow wasps, but I have seen female Greater Roadrunners (Geococcyx californianus) capture and eat them. The male Greater Roadrunner that frequents my yard completely avoids tarantula hawks, perhaps from prior bad experience. Tarantula hawks are common here in Tucson during early summer when dozens or even hundreds of them will congregate in any available cool, shady, green foliage seeking shelter from the extreme summer heat. These wasps love my yard in early summer, and every year I have hordes of them hanging about in the Lady Banks Roses at the edge of my patio. Whenever I walk too close to the rose vines, disturbed tarantula hawks will all come bumbling out of the roses and begin circling about like a rotating black cloud. This always terrifies me, but my clueless dogs find this thrilling, and they begin leaping and snapping at the slow-flying tarantula hawks. My dogs have obviously never managed to capture one or they wouldn't be doing this. Luckily, these and other tarantula hawks are not at all aggressive and are unlikely to sting unless captured. Adult tarantula hawks feed on flower nectar or the juice of damaged fruits. Like many other types of wasps, they have a fondness for sweet, oozing, fermented fruit and will behave quite drunkenly after consuming it. Perhaps this explains some of their occasional strange behavior that I have observed. 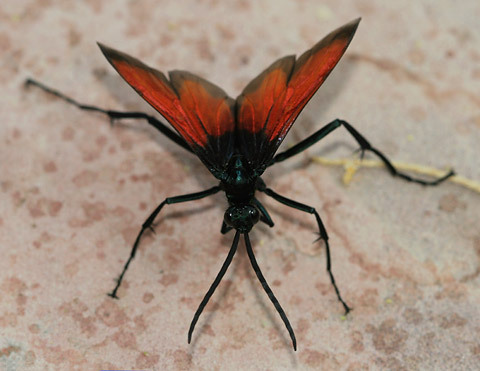 More than once I've had a tarantula hawk crash into me and fall to the ground and just lay there flailing about. I've also seen them do nosedives into the swimming pool for no apparent reason. The wasp shown below was one of the pool divers, and after it was skimmed out of the pool, it wandered around in a daze trying to dry off before finally flying clumsily away. Tarantula hawks get their name because the females hunt Tarantulas (Family Theraphosidae), huge, hole-dwelling spiders that are common here in the desert. Once a female tarantula hawk finds a tarantula, she will then attack the spider and sting it. The tarantula hawk's powerful venom paralyzes the tarantula, and the wasp then drags the spider back into its hole. The tarantula hawk then lays an egg on the still living, but paralyzed tarantula, and she then seals up the spider hole and departs in search of another victim. Once the egg hatches, the larva will feed on the still paralyzed tarantula, eventually killing it.